Even though plants in Central Florida stay green during the winter, they are still dormant. Many plants will grow very slowly or not at all during our coolest months. You will find that grass will not need to be mowed but every two to three weeks and will require less water. Watering every two weeks is sufficient. Grass that is allowed to grow a bit taller is less likely to suffer damage if there is a heavy frost or freeze. Fertilizer should not be applied during the winter months either. You still have time to grow some vegetables in pots this winter. I have a tomato, sweet pepper and some herbs growing on my pool deck inside the screen to protect them from deer and other critters. 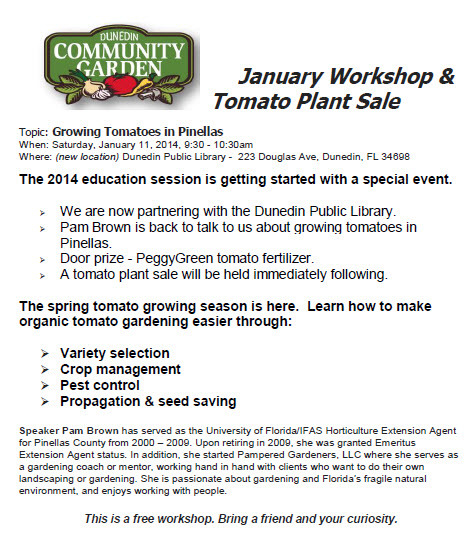 Consult the Florida Vegetable Gardening Guide at: http://edis.ifas.ufl.edu/vh021 for planting dates and varieties suitable for our climate. Winter and spring annuals make a colorful addition to the winter landscape. Pansies, petunias, sweet alyssum, snapdragons, million bells and pinks are a few nice ones to use in flower beds or in baskets and containers. All of these will survive forsts or freezes and keep on blooming. Other annuals that are a bit more sensitive to frost, but are good to plant now are impatiens, geranium, and begonias. Remember that impatiens are deer candy, so they are best kept in containers out of the reach of hungry deer. If you can find plants of fox glove and/or delphinium, they can add a tall punch to either large containers or flower beds. To keep all of these plant blooming into spring, remove spent blooms periodically, and provide a light application of slow release fertliizer at planting and then every two months. Citrus fruit must be fully ripe when harvested since the sweetening process stops once the fruit isis picked. Many varieties of citrus have a long season in which they can be left on the tree and gathered as needed, usually about three months. After this time, if the fruit is left on the tree, the quality declines as the fruit dries out. Near freezing temperatures are predicted for Pinellas County, FL this coming Monday and Tuesday nights (January 6 & 7). Frost and freezes are always possible in January and early February. Protecting tender plants is advised. Watch the weather reports for more temperature information. Common plants which require protection in home landscapes are copperleaf, banana, papaya, poinsettia, hibiscus, ixora, dwarf schefflera, croton, allamanda, sea grape, bromeliads, tropical fruit trees or any other tropical or semi-tropical plant you might have outside. Orchids should be brought into the house or garage for protection. Remember that tomato and pepper plants are also sensitive to cold.